The most successful Affiliates take advantage of all the helpful tools at their disposal. 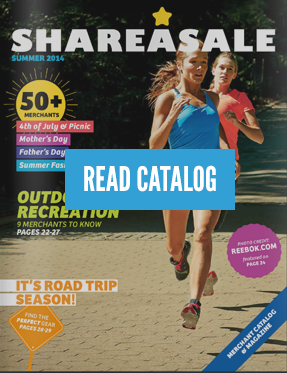 ShareASale has many available, and here are five you can use today! Ever wonder how certain links, or groups of links you’re promoting are doing as a whole? Enter Affiliate-defined tracking. That empty afftrack= value at the end of your links allows you to input any string, and see it reported in several ShareASale Affiliate reports. For example, perhaps you have a series of themed blog posts for the month with consistent traffic. You could add &afftrack=themedPost to the Affiliate links in these blog posts to see which transactions resulted from clicks on these particular links. You can view this information in the Activity Details Report. Interested in traffic stats? The Traffic Report allows you to filter your traffic by afftrack values too. Another common use of the Affiliate-defined tracking is to brand your links based on the user or source that clicks them. For instance, a cashback site that relies on knowing which conversions came from different members, puts &afftrack=memberID123 at the end of each link displayed to that user. This is how you could know which members/users made purchases on your links. Discover the latest new Merchants to join the network (there are many big ones!) in the the New Programs of Last 20 Days Feed. You can also keep tabs on Merchant Programs via the Online/Offline Merchant RSS Feed. Plus, find coupons and deals from Merchants across the network in the aptly named Coupons/Deals list. Did you know that Merchants have the ability to invite Affiliates into their program based on certain criteria? So keep a look out! Merchants might be seeking you out and offering you special commission arrangements just to join and promote their program! Go to Merchants >> Invitations and Settings to see if you have any pending invites from Merchants out there. Product links are some of the best converting traffic an Affiliate can send to a merchant. Are you using product links in your traffic? Pre-sell your users on the merchandise before they even leave your site. Make-A-Page Tool: It’s under Tools >> Make-a-Page and lets you create static tables of HTML content with products and their prices listed. It’s mainly intended for non-tech savvy Affiliates. Are you an affiliate looking for a way to beef up your blog? Do you want to add a “shop” to your site, but feel that you are not “technical” enough to do? Merchant Product Datafeeds: You can find the .txt file containing all a merchant’s products available under Links >> View Merchants with Datafeeds. This is formatted for easy import into Excel or a database. Narrow it down to merchants who have updated their products since a certain date, or belong to various categories. Under Links >> Get a Link/Banner: Merchants with product feeds will also have a dedicated tab for their products that you can use to search and find matches. The results will be automatically formatted in various styles with thumbnails, large images, price text, etc. Everyone these days is familiar with the common password credential. It’s how you prove to services like ShareASale you are the person who wants to login. To security experts the password is known as a “knowledge factor” – something only you should know and be able to apply. But what about using another, second “factor” for even more security? Using two-factor authentication, something you possess instead of know becomes an additional login layer. Go to Account >> Two-Factor Authentication for more information. Today I’m excited to introduce Two Factor Authentication for all ShareASale accounts. I’m a big champion of two factor authentication, and when available, I set it up on all of the online services that I use. Very interesting, I like the most the “beef your website” section. Take care, Ryan, nice post! I have never tried some tools like Make A Page and Sub-ID’s for affiliate links tracking. But as I have multiple websites, now will implement tracking for all sites separately to find which one is working better than others.